Don't judge a prince by his fur. 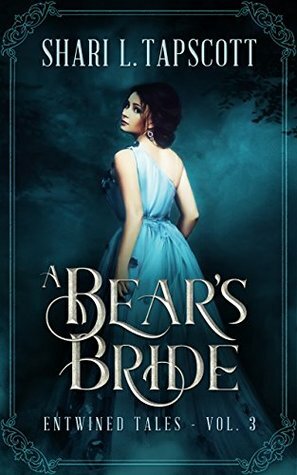 A Bear's Bride is a romantic fairy tale novella. It can be read on its own but is more fun when read as a part of the Entwined Tales, a series of interconnected fairy tales by six different authors. Each story follows the adventures of one of seven children from the same family as they seek out their own happily ever afters in spite of their reluctant fairy-godfather. I love reading books by Shari Tapscott. She's one of my favorites not only because she knows how to write great characters and fun adventure into her stories but because her books can be read and enjoyed by teenagers and adults alike. This novella is is part of a collection of stories, each written by a different author. I haven't read any of the other novellas but what a fun idea! Each book is based on a character from the same family. Fairy tale re-tellings are fun and this is a good one! I read through it quickly and enjoyed it very much.